Do you have an upcoming single-elimination tournament with 18 teams registered? Great, you’ve come to the right website. PrinterFriend.ly is all brackets all the time. No matter the sport, no matter the gender, we have blank printable brackets in a variety of layouts and formats. So no matter if you’re organizing the tournament, playing on one of the 18 teams in the tournament, or are an super-parent, significant other or good friend following your subjectively-favorite team, we’re going to provide you the bracket you’ll need to keep track of the tournament. With our clean and empty tourney brackets, you can keep on top of the latest teams that advanced or were eliminated as well as get an idea of the larger tournament standings with our printerfriendly brackets. What is an 18-Team Bracket? Tournament brackets vary in size based on the amount of teams participating. A 18 team bracket doesn’t work out as evenly as a 4, 8, 16, 32, or 64 team tourney would. In addition to an even number of teams, there needs to be an equal number of brackets as teams advance into the following rounds. For 18 registered teams in your single elimination bracket, your first round will require play-in games so the rest of the bracket will work out smoothly. That’s due to the fact that twenty teams puts up an odd number of winning teams from the first round, which means one team would not have a match up. Take a look at the below example 18-team bracket so you can understand what we’re referring to. You’ll see that as the tournament will progress from the first round to the second round and beyond and how that works out..
Our single-elimination, 18-team downloadable brackets are printable and blank so you can customize to your needs. They also come in a bunch of options. You can download and print them out in PDF, full-size image (JPG) or in Excel. For more on that, scroll down. Ready and willing? 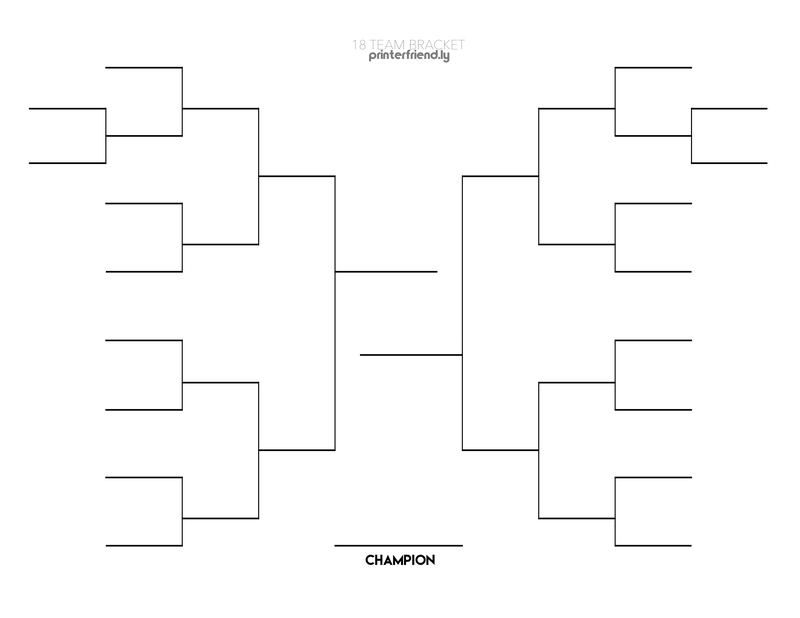 Now that you fully comprehend how a single-elimination, two-sided eighteen team bracket will work from a management perspective, do ahead and download our 18 Team Printable Tournament Bracket XLSX or print out the popular 18 Team Printable Tournament Bracket PrinterFriendly PDF format. With our brackets, they’re not limited to for basketball tournaments. They’ll work with recreational kickball leagues and dodgeball leagues too. Just long as the tournament is single-elimination then our blank tourney brackets will work with any team sport. For your benefit, we’ve made the below list of team sports that our printable brackets will work with (in alphabetical order): soccer (football), American football, hockey, baseball and softball, lacrosse, rugby, bowling, basketball, and beach volleyball.